The baby has reached the stage where he can grab food and put it into his mouth. It has resulted in many messes and an unforgettable evening where Daddy gave him a piece of banana while I snook out to a meeting for 1 hour. A packet of wipes, dunk in the bathtub and a tired baby later I’m still scrubbing his bouncer to try and get the stains off. As we’re doing a form of baby led weaning I’m not making a concious effort to cook different foods for the baby, more adapt what I am making to make it more baby friendly. That means that salt and seasonings tend to be added afterwards rather than during the cooking process like I normally would. 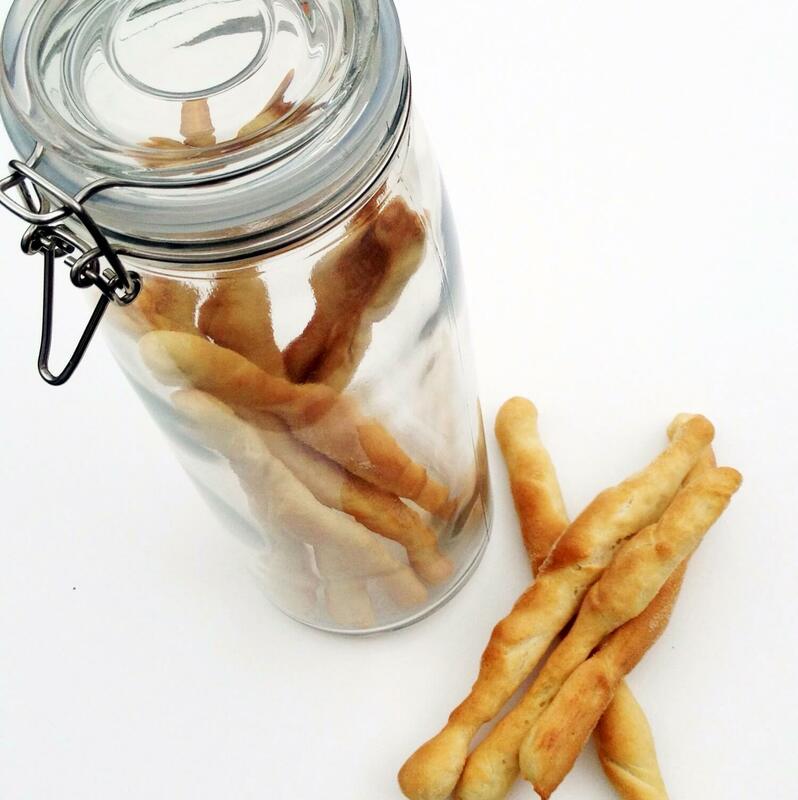 This recipe is for bread sticks that a baby can hold in their hand and chew on if they like. For a more adult twist you could coat them in sesame, poppy or nigella (black onion) seeds, or even just plain sea salt and black pepper before baking. Because there is no salt in the dough, they will only keep well in a sealed, dry container if they are well baked, hard the whole way through and cold. What I do is make a batch of the dough, cook 1/4 into breadsticks, cook another 1/2 into a focaccia style bread and refrigerate the last amount to bake the following day. Breadsticks are a great way to introduce new flavours to children by dipping into hummus for example. Let’s face it they’re also a yummy nibble to have before a main meal or with a glass of wine! Place your large bowl on the weighing scales and weigh all the dried ingredients into the bowl. Now place the jug onto the weighing scales and weigh out the water and add the sunflower oil then stir. Make a well in the middle of the bowl of dried ingredients and pour the liquid in. Mix until the ingredients come together into a ball. Knead for about 10 minutes or until the dough is smooth. Note – if you have a stand mixer with a dough hook then use it here it will save you time & energy! Wash and dry the bowl then spray the inside with sunflower oil. Place the dough in the oiled bowl then cover with cling film and leave in a warm spot to prove. This normally takes me about 2 hours but it depends on how warm your kitchen is. Once proved, preheat your oven to 200 degrees Celcius. Spray your baking trays then sprinkle with semolina flour to stop the breadsticks from sticking as they bake. Remove the cling film from the bowl and taking ping-pong ball sized lumps roll them between your hands until they become long sausages. Place onto the baking trays, about 3cm apart. Bake for 15-20 mins until golden brown and crispy. Make sure you remove these from the oven and carefully pop them onto a cooling rack for about 30 mins before eating.